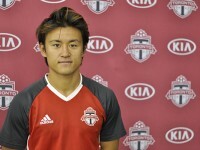 On Sunday, Tsubasa Endoh, 22, made his debut on the starting lineup of the Toronto Football Club. Endoh, a midfielder, signed up Toronto FC only a month ago as one of the team’s top prospects and he’s already making a huge impact. In its debut game of the season, Toronto FC won. The team beat the New York Red Bulls, the score 2 to nil. In the 37th minute of the second half, a player fouled Endoh as he attempted to slide in a goal after it had been blocked. This lead to a penalty shot and the first goal of the game brought to us by striker Sebastian Giovinco. During the preseason Endoh, who has been playing on the right wing, has been training to be Giovinco’s wingman. 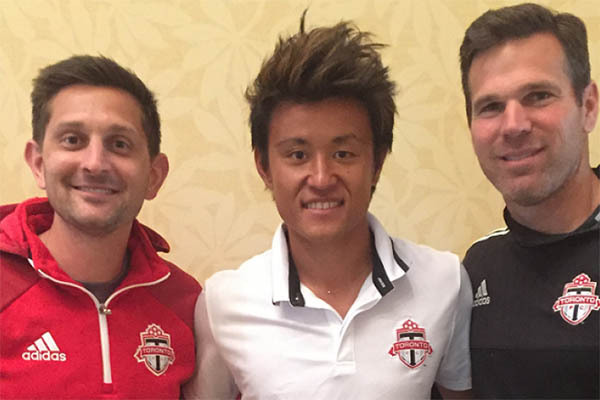 In the MLS SuperDraft held in January 2016, the Toronto FC named Endoh as their first-round pick. This is first time that a Japanese player has been picked in the first round making his selection a historic moment for Japanese Football Association. Since he was 12, Endoh belonged to Japanese Football Association Academy Fukushima, which trains top youth soccer players in Japan, and played with them for 6 years. He was also in Japan during the 3.11 Earthquake and Tsunami. When he was 18, Tsubasa began to play with the University of Maryland and played in 20 games in the 2012 season. By his senior year in 2015, he was named the Big Ten Championship Most Valuable Offensive Player and named to the Big Ten Preseason Players to Watch List. “I’m pretty excited. I try not to get nervous too much,” Endoh told reporters ahead of the game on Sunday. “If I play my soccer I should be fine; I’m just excited to play in front of the crowd and get out there.